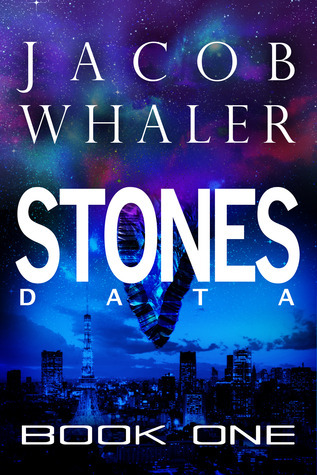 Meet Jacob Whaler, author of Stones (Data)! Today on the blog, I’d like to welcome Jacob Whaler, the author of a scifi/techno thriller who finds an ancient piece of alien technology that essentially leads him to trying to save the world. Synopsis: “A novel that will blow your mind and open your eyes! 1. How did you come upon the idea for your novel Stones (Data)? When I was six years old, I found a beautiful piece of obsidian half buried in the mud on a fishing trip with my dad and granddad. Granddad asked me to bring it over and let him have a look. I can still remember him studying it with a rolled cigarette hanging out of the corner of his mouth. His eyes lit up, and he nodded his head and told me that an Indian warrior had passed this way, took a chunk of flint out of his leather bag and made arrowheads to shoot deer and bears. Somehow, the rock I found had been left behind by the Indian. That immediately made the rock the most valuable thing in the world to me. I reached out my hand for it, but Granddad wouldn’t give it back. He said he needed it for his rock collection. I remember being on the verge of tears. I looked at Dad, and he nodded to Granddad, who must have seen that I was about to explode. Granddad handed the rock back to me and told me it was something special and that I needed to take good care of it. I put the rock on the window ledge above my bed and kept it close through the years. Over time, the story of Stones began to take shape in my mind. One day it just popped, and I knew that I had to start writing. 2. Is there a specific author that influences your writing style? The biggest influence would have to be Ray Bradbury. I started reading him as a teenager and fell in love with his evocative style. I still like to reread his short stories for inspiration. I’ve always loved Michael Crichton and his techno-thrillers. And then there’s Frank Herbert and the whole world of Dune. Dan Simmons and his Hyperion books. Alan Dean Foster. J.R.R. Tolkien. So many . . .
3. Are you a late night or early morning writer? Neither, really. I prefer to go to bed early and get up before dawn to do hot yoga. I do my writing during the day whenever I can catch some free time. I do my best to be available for my family when at home, so I try to not spend all my time typing behind closed doors. There are times when I’m really in the flow of things, and then I grab my laptop and find a cozy chair near a window to write. Writing in public places (train, bus, library) works well for me. 4. Can you sum up Stones (Data) in one sentence? A young man finds a piece of mythical technology that gives him cosmic power and forces him into a battle for the future of the human race. 5. Do you remember the exact place you were or what you were doing when the idea for your novel came to you? The seed of the idea was brewing inside me for a long time, but it finally popped one day when I was standing in my house looking down at the black lump of obsidian in my hand. I thought, what if . . .
6. What’s your writing muse? My muse is my own sixteen year old self, still sitting in the big green chair next to the window back home in the front room lost in a book. It’s winter, and Mom is in the kitchen cooking up fried chicken, corn and fresh whole wheat bread for dinner, filling the house with the most wonderful smells. The world is perfect. That’s the scene I like to play in my mind as I sit down to write. And then I think, If I were sixteen again, what would I want to read . . .
7. If you’re stranded on a desert island and only five items survived with you, what would they be and why? Five items: (i) a notebook and pencil, so I can write; (ii) my eyeglasses, so I can see; (iii) a large platter of fresh sushi–yellowtail, sea urchin and fatty tuna–so I can keep up my strength; (iv) a picture of my family so I can keep up my hope; and (v) some Shakespeare or Plato to occupy my mind. 8. Do you prefer physical or ebooks? I love both, but lately I’ve been reading ebooks more. The Kindle fits so neatly in my backpack, and is so easy to pull out and read any one of the twenty or so books I have loaded on it. If forced to choose, I’d probably go with ebooks. 9. Which writer would you love to meet? That’s easy. Ray Bradbury. His fiction opened my mind and sparked my imagination as a kid, and it’s still with me. 10. What is your next writing project? I’ve already started working on a dystopian techno-thriller set in Japan a hundred years in the future. It will deal with the aftermath of all the environmental devastation going on and the ever-widening gap between rich and poor.